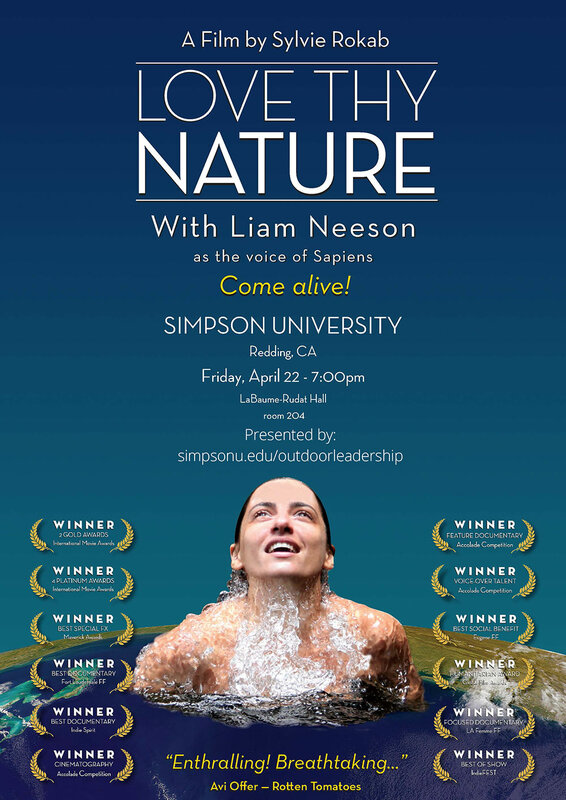 REDDING, Calif. - Simpson University’s Outdoor Leadership program will host a free screening of “Love Thy Nature,” an award-winning film narrated by Liam Neeson, at 7 p.m. Friday, April 22, in celebration of Earth Day. The event, which is open to the public, will be in LaBaume-Rudat Hall, room 204, on campus at 2211 College View Drive. “Love Thy Nature” is a 75-minute documentary described as a cinematic journey through the beauty and intimacy of our relationship with the natural world. The screening, which will include an introduction by Outdoor Leadership professor Amy Smallwood and a student-produced short film called “The Book of the Beginning,” helps kick off Earth Day events in Redding that weekend. Shasta College will host an Earth Day Celebration open to the public in its campus quad from 10 a.m. to 2 p.m. April 22. It will include music, poetry and educational opportunities. On April 23, the 10th annual Whole Earth and Watershed Festival will be held at Redding City Hall and Sculpture Park. "The Outdoor Leadership program at Simpson is passionate about the intrinsic value of the natural world,” Smallwood said. “The film highlights this and helps us to recognize our responsibility to appreciate and value our planet and not just use its resources for our convenience. We are excited to be able to join in and contribute to the Redding community's Earth Day celebrations by hosting this screening." Learn more about Simpson University’s Outdoor Leadership program at simpsonu.edu/outdoorleadership. Watch a trailer of the film at this Facebook event page.